Solar plants can exist over a large geographical area and operators must be able to easily and quickly determine the �health,' status and performance of individual assets and the system as a whole. Colin Lippincott | FreeWave Technologies, Inc. The Photovoltaic (PV) industry continues to expand as a result of growing public support, advances in technology and efficiency, declining equipment costs, investment tax credits and other incentives. As this utility-scale market grows, there is new focus on reducing solar plant capital expenditure (capex) infrastructure costs and keeping overall operational expenses (opex) to a minimum. Implementing a secure wireless network within the PV plant can help to increase operational efficiency while lowering opex expenses. Solar developers and producers will execute Power Purchase Agreements (PPA) that contractually obligates them to provide fixed or variable energy rates (or energy amounts) to the utility and municipality customers. These long term contracts put additional pressure on the owner/operators to reduce their operational expenses to increase the Return on Investment (ROI). The plant opex is directly tied to the operator Levelized Cost of Electricity (LCOE), which is an economic assessment of the cost of the energy producing plant including all the costs over its lifetime—initial investment, operations and maintenance, cost of capital and the cost of energy required to operate the plant. Solar plants can exist over a large geographical area and operators must be able to easily and quickly determine the ‘health,’ status and performance of individual assets and the system as a whole. Remote sensors (see Figure 1) can proactively alert the operator when issues are rising and instruct on the preemptive maintenance or action that is required. Telemetry (or telematics) is a process that allows reporting and measurement of critical data from remote devices. Sensors are used to collect metrics including PV output power/current, module temperature and PV panel incline angle (for tracking PV). The sensors’ reading is then sent back through the telemetry system to a central location. Telemetry can use wired, fiber optic or a wireless infrastructure, and has been used in network management, agriculture, oil and gas industries for decades - among many industries. In large solar installations, management software can frequently poll thousands of sensors and alert the operator if conditions fall outside the predetermined values. Alerts can be sent by audible/visual alarm indicators, text messaging/paging, emails or automated telephone calls. Alerts also can be used for auto-correction of the fault condition. In addition to these individual metrics, overall weather conditions across the solar plant can be monitored by a weather station or meteorological tower (MET tower)—Direct Normal Irradiance (DNI), Global Normal Irradiance (GNI), ambient temperature, wind speed and direction, rainfall and electric field (meter to provide warnings of potential lightning strikes). A wireless network also can be used for perimeter security of the plant. In a solar plant network, typically Ethernet (TCP/IP protocol) is used to monitor and report issues or problems to a centralized sub-station or operations and maintenance (O&M) office. Operators may need a wireless network if they require redundancy (to remove single point of failure and added plant security) or they do not want to mix monitoring signals with control signals on the same network (sometimes called out-of-band monitoring). In some cases there may be government regulations (in the United Sates, Federal Energy Regulatory Commission-FERC) on disruption or alteration of the operating network. The cost of installation of a fiber optic network is staggering when considering potentially thousands of drop points on a network, as well as the trenching, necessary fiber optic cable and required conduit. Any moves, additions or changes can be cost prohibitive and disruptive to the operations and power production of the plant. Secure wireless technology that has been proven in the military and high noise/interference environments is now being used for utility-scale solar plants. This wireless technology uses Frequency-Hopping Spread Spectrum (FHSS), which is a method of transmitting and receiving radio signals by rapidly switching among many frequency channels. It uses a pseudorandom sequence known only to both transmitter and receiver. Using FHSS, filtering and encryption, radio manufacturers can give plant operators maximum uptime of the wireless network, also while providing a high degree of security and resiliency. Because the radios transmit by rapidly changing channels, it is virtually impossible to jam or intercept radio transmissions. In these solar applications, a wireless network topology of point-to-multipoint is preferred over meshing topologies. Point-to-multipoint means that a ‘master’ radio transmits and receives to multiple remote radios. Telemetry applications will typically use this topology as network bandwidth is maximized and latencies in obtaining sensor data are known and predictable. In meshing networks, the bandwidth of a meshing radio also is used by neighboring radios in the retransmission of data, thereby reducing the available bandwidth of the meshing radio. In addition, since the path from sensor to the O&M office is created in real-time (based on noise, interference and other network ‘costs’) meshing networks create unpredictable delays in obtaining remote sensor data. This can jeopardize the data integrity within the network. For the solar plant operator, there are many choices in the frequency spectrum. The most common is in the range of 902–928 MHz, referred to as the 900 MHz band. In the United States, this 900 MHz band does not require the operator to hold an active FCC license. The 900 MHz band performs well (in conjunction with FHSS) in noisy and high-interference environments. It also is preferred for transmitting and receiving over longer distances. Many times the O&M office will be located greater than a mile from the furthest sensor point. Another available, license-free choice in the US and other parts of the world is the 2.4 GHz band. This band has a number of limitations that 900 MHz band does not due to the frequency propagation differences. Plus, there are two distinctive protocols in the 2.4 GHz band. One protocol is robust and industrially hardened for outdoor applications. When compared with 900 MHz though, it has a much shorter range and requires much more deliberation on the network design. The commercially popular protocol in the 2.4 GHz band is unlicensed and used in Wi-Fi and Bluetooth applications. It is not nearly as robust in these solar power plant environments because of its poor noise and interference handling capability. As the sensors are continually being polled, the individual radios send the data stream to the master radio, usually located at a sub-station or O&M office (see Figure 2). Engineers of the wireless network must make calculations on what is measured, how often the sensors are polled and balance this with the number of wireless connections required and the available bandwidth. Operators will require the aggregated data stream to be stored and archived for future use. From this aggregated point, there are usually two different methods that operators can deal with data that is out of specifications-automatically adjustment or manual intervention. A ‘smart’ wireless system will include a feedback system that will automate control of a device. For example, as an off-track PV panel position is polled and wirelessly sent to the aggregation point. From this point, a decision can be made by the Programmable Logic Controller (PLC) at the control point and control program to send a correction signal back to the positioning motor. 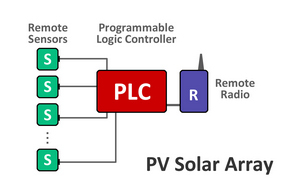 PLCs add the remote intelligence to the solar fields necessary to track the sun, adjust the collectors, and make real time adjustments based on sensor data. This system topology is referred to in this document as deploying distributed intelligence where the PLC’s are deployed at the remote control point and make many decisions at that point without communicating to the host server. Trackers can be optically-based or algorithm-based. The wireless network can be a key element in the feedback system that helps position the collectors with precision. The algorithm-based tracking systems use a software model inside a PLC automation controller to know where to position the panels/collectors (A common algorithm called the Climatological Solar Radiation [CSR] model for solar tracking was developed by NREL for the U.S. Department of Energy). Management software allows the operator to quickly determine the performance and efficiency of the solar plant. These software tools usually have monitoring tools to detect, diagnose, and resolve network and bandwidth issues. There are many software applications (off-the-shelf and custom written) available to graphically display the aggregated sensor data in a ‘dashboard.’ Most management software will allow the operator to ‘drill-down’ to the individual sensor reading. A key indicator is efficiency, which is the comparison of power generated to the measured solar radiance, or thermal collection to measured solar radiance. If this calculation strays outside the predetermined boundary, it could indicate a collector issue or soiling (build up of dirt) which could then generate a preventive maintenance service ticket. Other metrics that would generate a maintenance service ticket include low power, voltage or current, module temperature, azimuth, tilt and height of modules (affects the cooling and heating of modules). Data from the O&M office also can be sent to other sites, such as a corporate office via the Internet through a secure Virtual Private Network (VPN) which uses a protocol suite called IPSec (Internet Protocol Security) to provide authentication and encryption of collected data (see figure 2). A graphically based management tool can be used at this corporate office to quickly interpret the data. In addition to the operator, making performance data available through a secure web connection can offer a large benefit to the end user (power purchaser) to enhance their marketing efforts, and promote their solar system to the community. All systems whether wireless or wired have to be acceptably secure and reliable. Every wireless protocol is by its very nature open to noise, interference and security challenges. The economic trade-offs discussed above and the flexibility of wireless systems has driven the adoption of wireless systems in many, many industrial and military applications. A properly architected and deployed wireless system will mitigate these issues very successfully. Wireless systems have been the only link to many remote sites for years and years. In tracking PV installations, there are many moving objects and metal surfaces. Depending on where the solar plant is built, there may be stray radio frequencies (RF) from municipalities, irrigation systems, pipelines, wireless meters, cell phones and other wireless devices. These moving surfaces, metal parts and stray RF signals can interfere with a wireless device. If not properly designed for mitigation, the network performance may decline or connections get dropped completely. Making appropriate system adjustments to a properly designed network is typically not difficult. 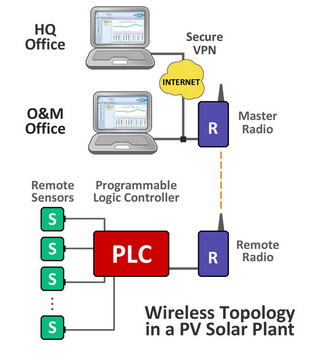 PV system operators also can use wireless systems for security. Specific alarms can be triggered if a PV panel output power is measured at zero (PV panel is disconnected by vandal or thieves). Perimeter intrusion detection systems can be installed using motion-detection and video cameras. Bandwidth requirements can vary depending on the resolution, color level and frame rate of the video. Some low bandwidth systems use infrared sensors to detect movement, and upon movement will take a black and white image of the area under surveillance. This image is then wirelessly sent to the operations office for further analysis or action. These types of wireless systems offer a high degree of flexibility and avoid the costs of new trenching, new conduit and wiring. Wireless security systems have been used for many years by airports, utility substations, power generation plants, public works facilities and warehouses. As there is more push to reduce operational expenses and increase the efficiency of utility-scale solar plants, operators are looking to wireless technology to provide real-time metrics, operational data and plant security. This data can help identify issues before they become problematic, assist with diagnostics and even recommend preventive maintenance. Keeping the plant uptime to a maximum, while making sure power production is maximized is a great way to increase the ROI. Colin Lippincott has been with FreeWave Technologies, Inc. for seven years. In his current position, general manager of renewable energy markets, he works primarily with solar, wind and smart grid technologies to advance remote automation, condition monitoring, positioning and SCADA success with affordable wireless systems and unmatched reliability. Prior to FreeWave, he served in various management and operations roles with several companies since graduating from the University of Colorado with a Masters in Business Administration.